The holidays are creeping up and we were starting to wonder if we would actually see any major Android devices landing on store shelves or if this year’s shopping season would be uneventful, while we all look forward to CES in January. Up until now, we had only heard a few rumors, but we’re thinking Samsung is prepping something major as they have just invited media members to a special event on November 8th. Update: Reader Endisky suggests it will be the Continuum and we’re pretty sure he’s right. 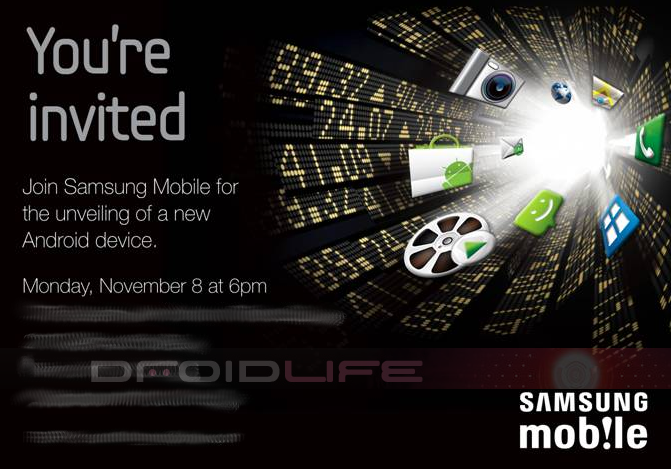 Join Samsung Mobile for the unveiling of a new Android device. What could this be? People have suggested that this might be a “stock” Android device and that the stock market ticker is the clue, but that giant blue box up there is the TouchWiz launcher button leading us to believe it’s something else. Maybe the first Gingerbread device? Afterall, Google did unveil their new statue on Friday.